If you ever dreamed of recording videos with your Chromebook's integrated webcam through the default Camera app of the Chrome OS operating system, now you can. 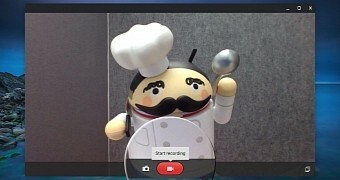 Chromium evangelist at Google François Beaufort announced recently on Google+ that Google updated the Camera app in Chrome OS and added video recording support, allowing users to record videos of themselves or whatnot. To record videos, all you have to do is to update to the latest Camera app release. Then open the Camera app and click the "Switch to record video" button. Videos will be saved locally on your Chromebook and can be accessed from the gallery section of the app. You can play them with the integrated video player app that comes with Chrome OS, as well as to share them on YouTube. "We can now record videos from the updated Camera app installed by default in Chrome OS," François Beaufort on a Google+ post. "Open the app, hit the "Switch to record video" button, and start video recording. All your recorded videos will be saved locally in the gallery section of the app." The Camera app version 5.0.0 is the one that brings video recording support, and it's now live for all Chromebook users in the Chrome Web Store. Designed to take pictures and record videos, the Camera app in Chrome OS is very easy to use and has an intuitive interface that any computer user will be able to use without any hassle. All Chromebooks come with Chrome OS pre-installed, and the Camera app is available by default, needing no extra effort from the user to install it. In general, Google managed to design a computer for everyone and it did a very good job with the Chromebook, which runs Chrome OS, a Linux-powered operating system from Google.